Here is the complete solution to the Inka Game - Lisa Saw. 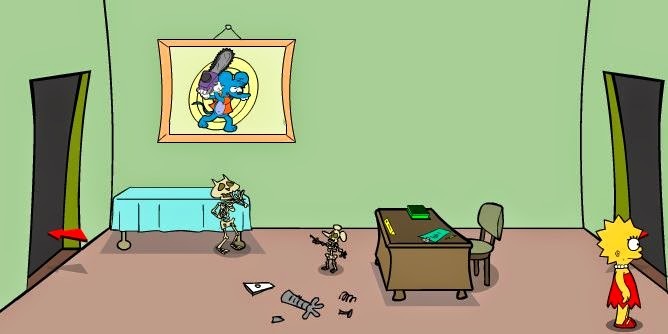 This walkthrough will help you solve this point-and-click room escape game. If you are stuck then this walkthrough is exactly what you need. 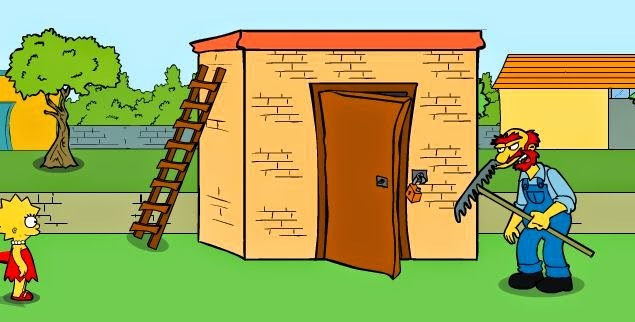 It is a step-by-step guide that will help you solve all the rooms and escape... alive! 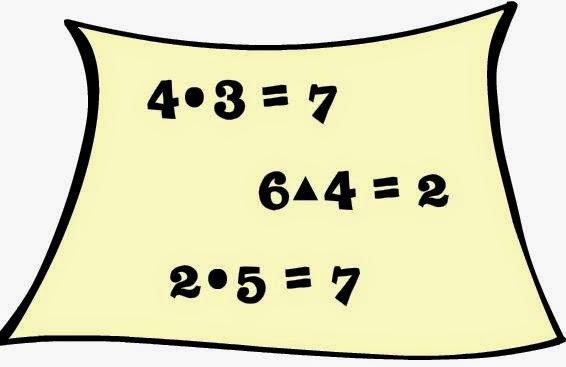 If you need more help or more detailed explanations, then please use the comments section below. 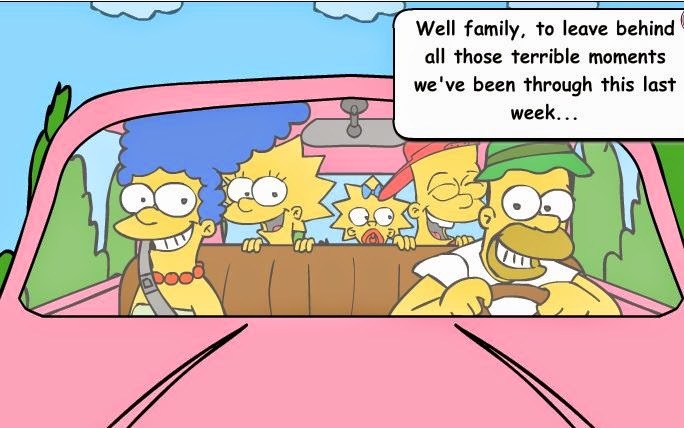 The wicked Pigsaw is back crazier than ever and will force poor Lisa Simpson to go through dangerous tests to rescue Homer, Marge, Bart and Maggie. 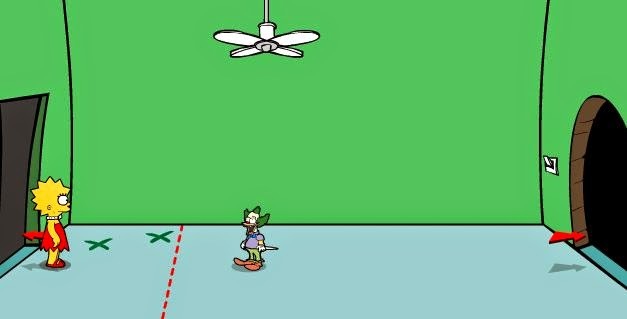 You need to help Lisa overcome all the obstacles of the evil puppet. 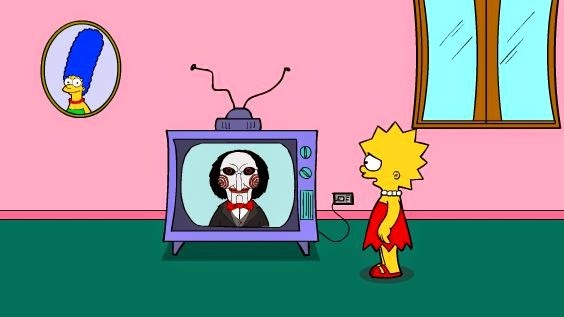 You can play Lisa Saw here. 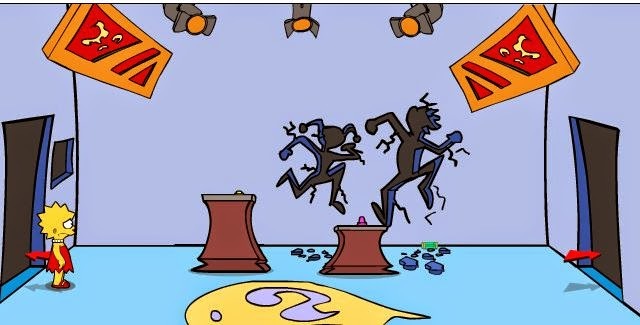 After the intro, the adventure will start in the Simpson's lounge in front of the TV. Take the matchbox from the floor. Take the bottle of oil on the counter top. Go right to the dining room. Go south to the hall. Take your Rollerblades behind the closet. Take the yellow backpack bottom left corner. Take the perfume on the desk. Take the doll on the bed. Take the piggy and alarm clock from the bed-side table. Take the musical score from the music stand. Take the pillow from the bed. Take the pair of scissors from the floor. Take the slingshot, hammer, C3PO figure, fan. Take the picture from the picture frame on the bed-side table. Talk to Millhouse just for fun. He is in love with Lisa... we could abuse that a bit later. Use the teleporter map and go to the school. Talk to the Bumblebee man. Use the hammer to break the piggy bank in your inventory and get a 50c coin. Give the 50c to the Bumblebee man to get a balloon. Grab the picture and give it to Principle Skinner. He will give you a dollar for it. Talk to the girls to learn why they are upset. Trade the doll for the pieces of paper. Talk to Willy to find out why he is upset. Talk to Willy... "I've got information..."
Learn that he needs something to cool off. Use the perfume, then walk pass Francine. Talk to the Prof to learn about his glasses. Use the teleporter map and go to Kwik-E-Mart. Use the alarm clock to learn you need to make it louder. Use the teleporter map back home. Talk to Millhouse..."can I borrow your glasses". Quickly use the dog on him. Give the glasses to the Prof.
Take the objects on the desk. Give the alarm clock to the Prof. It will now be louder. Use the teleporter map and go to the Comic Book Store. Talk to the salesman and ask if his stuff is expensive. Put the CP30 action figure on the counter. You will get the costume in exchange. Use the 2 pieces of torned music on each other. Fix them with duct tape. Use the "edge of glory music" on the saxophone. Use the loud alarm clock on the counter. 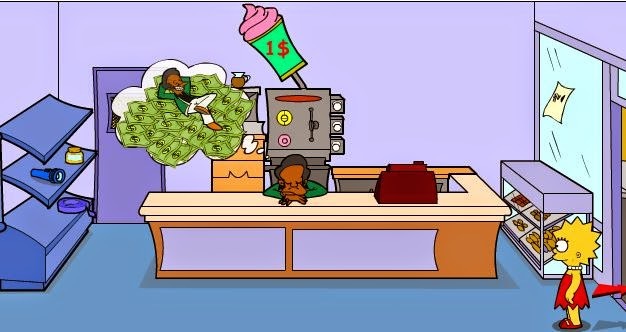 Give the dollar to Apu. You will get an ice cream. Give him the ice cream. You will get the balloon. Use the teleporter map and go to the Cemetery. Talk to the guard... "why the long face?" Place the pillow on the ground. Use the oil on the balloon from Ralph. Use the oily balloon on the pig. Talk to the guard "can you let me in?" Take the 25c coin in the grass. Play the sax jazz piece on the saxophone. Tell the ghost "can you teach me how to play pop..."
Use the 25c in the candy dispenser. "Use the edge of glory" music on the sax. Now it will sound so much better. Give the 20$ to Apu. Take the glue, flashlight, and insulating tape. 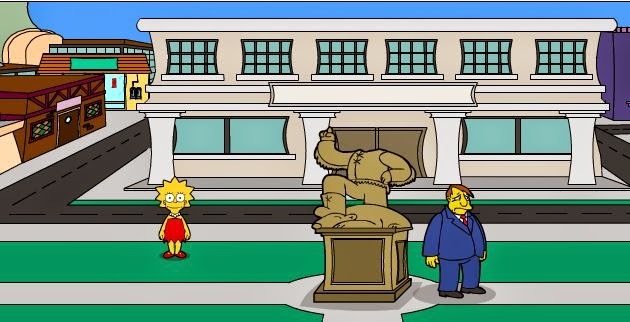 Use the teleporter map and go to the Statue of J Springfield. Use the ladder on the statue. Use the super glue on the metal head. Use the metal head on the statue. 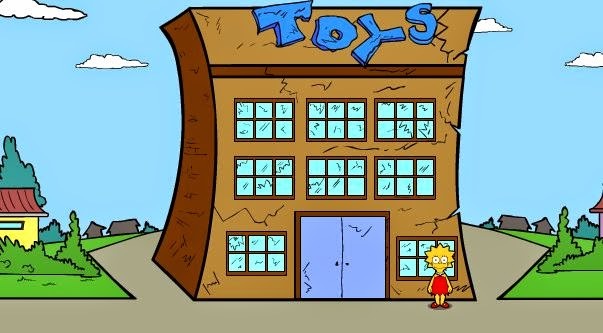 Talk tot he Major "have you seen the new statue"
You will get "The Key to the City"
Teleport tot he Abandoned Toy Store. Use the green mutant stuff on the candy. Use the candy with the slingshot. When the alien takes his helmet off, you need to take it. 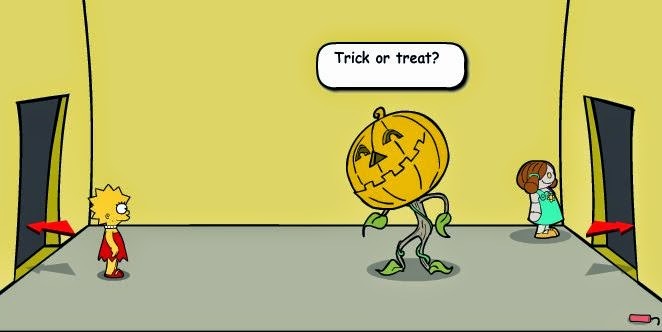 Choose Treat... then shoot the pumpkin using the candy-sling-shot. Take the dynamite and the doll. Add glue to the glass helmet. Use the glued-helmet on the dog. Use the dynamite on the big doll... it will zoom in on the doll. 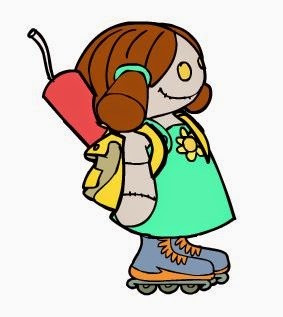 Add the backpack to the doll. Add the dynamite to the backpack. Use the match on the dynamite-doll then place her on the X. Be quick or it will explode you. The doll-with-dynamite will take care of the jack-in-the-box! Look at the batman doll. Take the batman sign from the doll. Use the batman sign on the flashlight. Shine the flashlight into the window next to the door. Use the scissors on the fan. Use the fan's cable on the lever then into the plug on the machine. Take the stone from the conveyor belt. If Lisa did not take it, take the stone again. Use the plug on the fan. Use the insulation tape to fix it. Place the robot on the X. Place the fan on the X. Tie the balloon to the brick, then place it on the second X. Then quickly use the slingshot to shoot the balloon. So, DOT = PLUS. Triangle = MINUS. 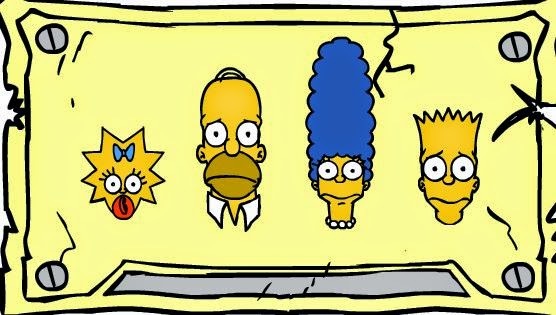 So, the order is Maggy, Homer, Marge, Bart. 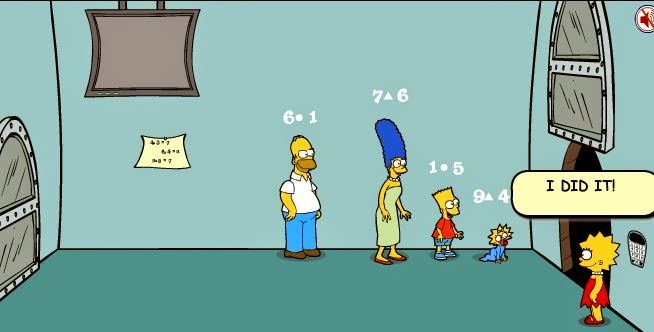 Bart = 1 dot 5 = 1 + 5 = 6. Well done on solving Lisa Saw Escape. How do you strike the match? When I played, the code differed from the code you've written here.